You are here: Home » Blog » PSG Legacy Articles: Is Courage Enough to Succeed? Courage is a power that moves us forward and challenges us to become better every day. In June 2014, we published this article, where fellow coach Joanna Sobczak-Michalowska explains in detail what courage is and how we can free ourselves through it. Take a ‘yourself’ time to read and reflect on these wise words. According to Collins English Dictionary COURAGE is “the confidence to act in accordance with one’s beliefs”. Is that enough? Is acting in accordance with one’s beliefs enough for someone to be called courageous? “The state or quality of mind or spirit that enables one to face danger, fear, or vicissitudes with self-possession, confidence, and resolution.” . In other words courage is bravery. Courage is a conviction. It means being sure that you have what it takes. Even though much simpler the first definition feels truer to me. I don’t need to be endangered or challenged to act with courage. 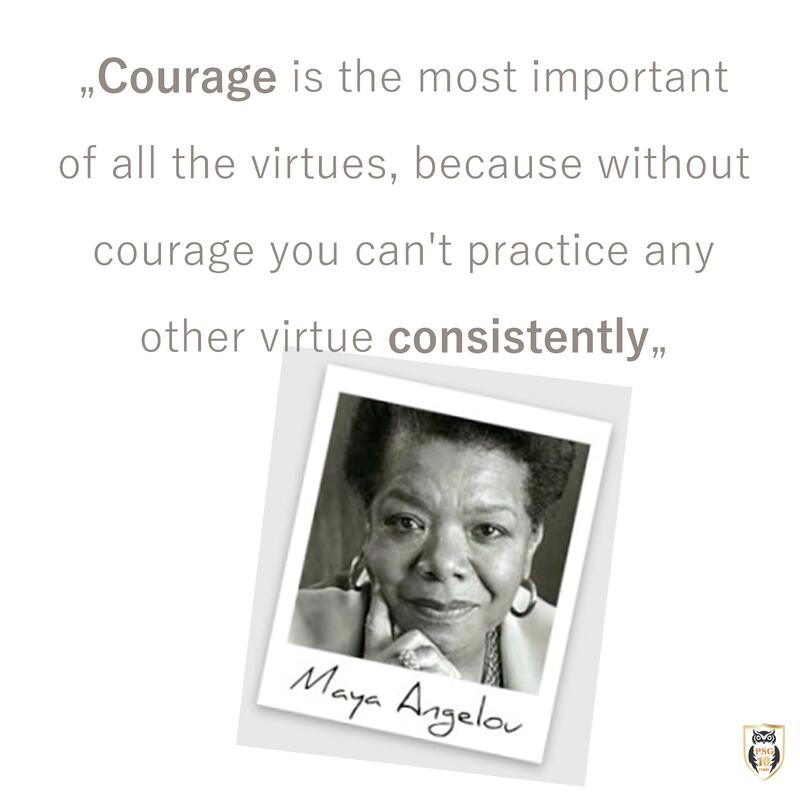 Every one of us can be courageous in our everyday actions. Do we need to be threatened to act courageously? I don’t think so. Being who we truly are, standing up for what we believe and being honest about our needs and expectations can be defined as courage. This would be my personal definition. But there seems to be something else needed. Courage on it’s own doesn’t make us great and it doesn’t make our work valuable. The fact that we openly share our views, take action and rise to the occasion is not enough. It’s vital for success but not enough. It makes me think. Even though very important, courage seems to be an enabler; the beginning. It must be there to enable action and success but my attention goes to those other virtues that make courage purposeful: curiosity, ambition, tolerance, honesty, kindness, empathy, respect, integrity or honour. The best and the worst thing about courage is that anyone can have it. Absolutely anyone. But not everyone achieves greatness and sets standards for others. Can you be courageous and harm, hurt and damage? Absolutely. Courage in itself is neither good nor bad. Our thoughts and subsequently our actions make it so. Not everyone brings value, motivates and unites people to act together. This is because courage doesn’t make a leader. All of the other virtues, taken together, do! Courage can be easy. Yes, I am serious. It is easy to be courageous when you know why you are doing something and believe that what you’re standing up for is true. Courage doesn’t take enormous effort and is not something you have to practice tirelessly. I believe that courage is a natural result of exercising all of the other virtues. They are drivers for courage and they make courage valuable. What matters is NOT that we believe something to be true. What we belief to be true is what matters! Most inspirational leaders in the world are who they are, thanks to their belief systems – and it was courage that enabled them to speak and act their truth. Work from the inside-out and others will follow you. Who do you feel free to be? What do you feel free to do, say or think? What action do you feel free to take? Exercising this freedom of being starts inside you. When you truly recognise your value, when you believe that you have a lot to offer and you can make a difference. Not only in your own life but in the lives of others. When you know you have the freedom to be a full and wholehearted human being. Freedom is showing up with honesty and truth, making the most of your own best qualities and the best qualities in others. Courage is the enabler that helps makes those qualities visible. Why choose Positive Success Group?